Make sure you have a family plan: Storms can be unpredictable and your family may not be together when it hits. If the kids are at school or you are at work, you’ll need a plan on how to connect with each other and where to meet. The Florida Division of Emergency Management offers the “Get a Plan” site, where they offer personalized advice and recommendations to develop a plan based on your family and location. Call or text 2-1-1: The 2-1-1 Information and Assistance Helpline serves as Central Florida’s natural disaster helpline and is available 24/7/365. They can assist with shelter and housing information, evacuation routes, locations for sand bags, hygiene items and medical supplies and more. You can contact them by dialing 2-1-1, texting your zip code to 898211 or via chat on HFUW.org. Update your insurance policy: Not all home and renter insurance policies cover flood damage, so be sure your policy does. Take an inventory of items in your home, including photos of valuables, and keep them in a water-proof container or safe. Better yet, save an electronic copy on Google Drive or another cloud storage system so you can access your documents even if you cannot get back into your home. Prepare a home emergency kit: Keep non-perishable foods, a manual can-opener, batteries, first-aid kit, flashlights, a crank radio, bottled water, blankets, and important documents in a secure container. It’s a good idea to set aside 5 days of water and food to prepare for the worst. If you have pets, make sure you have food and water set aside for them as well. Since credit card machines and ATMs may not be working during a disaster, it also is a good idea to keep an emergency stash of cash in your kit to get you through the first few days. Fill up containers: If a storm is incoming, fill up the bathtub and other large containers with as much water as you can. In case of power and system loss, you can use this water for washing, cooking and even flushing the toilet. You will also want to make sure your car has a full tank in case of evacuation. Stay inside: During a hurricane, stay inside and get into a room in your home with no windows, even if that is a closet or bathroom. Use your emergency crank radio to stay updated on the storm and when it is safe to come out. Evacuate when ordered: If an evacuation is ordered for your area, leave immediately! Delaying could make it impossible to get to safety or for emergency personnel to reach you. Calling 2-1-1 can help you navigate road closures and they will also be able to direct you to sand bag locations, shelters and other disaster information. 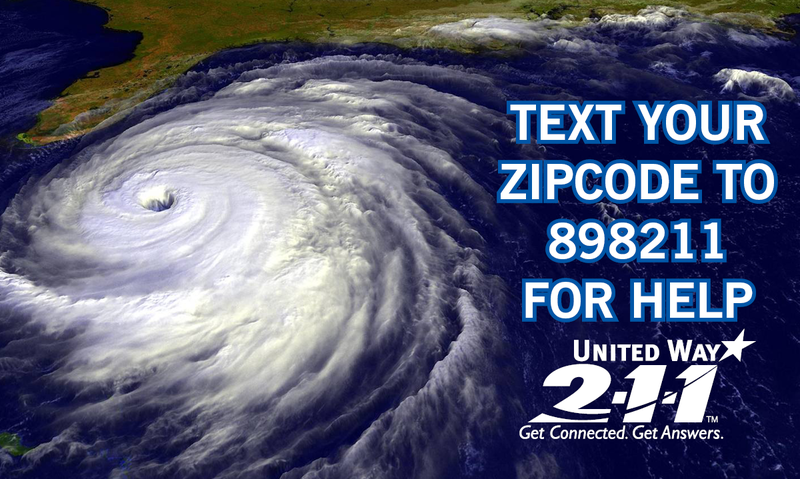 In addition to providing critical information about evacuation routes, shelters and resources prior to a major storm, United Way’s 2-1-1 also helps residents find assistance with food, water, debris removal, power restoration and other critical needs in the immediate aftermath. During times of disaster, 2-1-1 also coordinates response efforts with Emergency Operations Centers in Orange, Osceola and Seminole counties, as well as local agencies that provide help with food, shelter and other essential services. 2-1-1 is available by phone, chat, text and email. For more information, visit HFUW.org.